Last day of work in 2017! The campus closes at 5pm today for the winter break. Despite the campus being quiet all week, I’ve been pretty busy: training an Economic prof on Zotero as he begins writing his next book; creating promotional videos for a couple of entrepreneurship classes switching to online format; preparing to teach my 530 class next semester; and working on BLINC projects as its new chair. We formed BLINC (Business Librarianship in North Carolina) in 2003 as an independent group representing public, academic, and special libraries. BLINC joined the state library association, NCLA, a few years later as a new section. However, we have continued our tradition of offering quarterly workshops that are free and open to all. Workshop locations rotate around the state. And the declining number of librarians with a focus on outreach and service to entrepreneurs, nonprofits, and small businesses. That last trend is particularly disturbing. Wake County Public Library is our poster child for that one. Wake is the second largest county in population in the state; it includes Raleigh, Cary, and the southern edge of Research Triangle Park. Normally the public library systems in larger counties have a business librarian. Wake once did (Susan Wolf Neilsen, a 2016 winner of the BRASS Public Librarian Support Award sponsored by Morningstar, and co-founder of BLINC, now recently retired; Kathe Rauch was another Wake County public librarian involved in BLINC –Kathe recently retired too). But apparently the library administrators there have a strong focus on children now, not proactive engagement with entrepreneurs, nonprofits, and small businesses to support economic development. Wake Co. is also unusual for not having a central or headquarters library, which is where a business librarian would normally be based. In strong contrast is the High Point Public Library (a city-based, not county-based library, which is uncommon in this state). HPPL has three business librarians (Cassie Ettefagh, Vicki Johnson, John Raynor) charged to build connections across the city, provide support in economic development and job hunting, and promote the value of the public library to community stakeholders. There are also academic business librarians (or liaisons assigned to business programs among other programs) who are not very engaged with BLINC. This is sometimes due to geography – it’s a long drive from the coast (UNCW) or the mountains (WCU) to the center of this state. BLINC needs to put more energy into recruiting and welcoming new members. 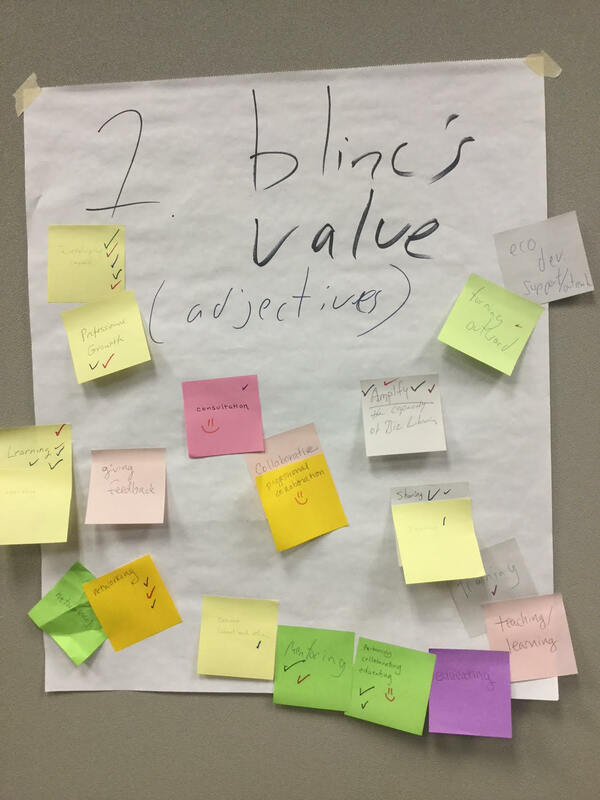 So at our winter workshop two weeks at the Greensboro Public Library, a dozen BLINC friends spent two hours after lunch brainstorming some strategic planning, including marketing and promotion. 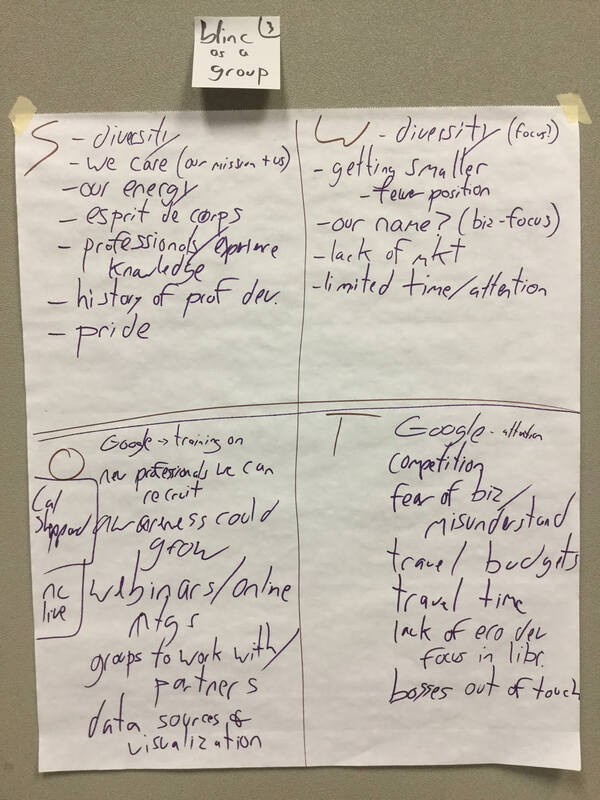 Our discussion included what are the trends with our own positions and professional needs, not just trends in BLINC, since BLINC needs to remain relevant to our own needs. Opportunity to collaborate with other business librarians: conference presentations, publications, etc. Getting help with a tough question. Our name – too business focus? There’s also nonprofits, entrepreneurship, job/career services, economic development. Some folks who are not full-time business librarians might be scared off by the emphasis on the B-word. Our bosses out of touch with community needs, possible roles of libraries in communities. Teaching and training techniques (on business research topics, not common info lit topics). We have begun to work on some of those ideas already, with more work to come in 2018. My fellow officers for the next two years are the amazing Sara Thynne of Alamance Community College and Arnetta Girardeau of the NCCU Law Library (very recently the business librarian for Greensboro Public). The three of us will try to leverage the full BLINC membership to identify potential new members (or former members) and reach out to each person individually. Time consuming, but more effective than a blanket emails to NCLA-L.
We also plan on targeting messages to library system directors, with the angle that “if your library has a goal to be more involved in your community, then you need a BLINC representative” (something like that). We also need continued programming, attractive and convenient, promoted effectively. We have had that every year since 2003, although not always promoted as well as could be. But there are some other types and formats of programming, alone or with other groups, we could consider adding to the mix.